A Tactile Ground Surface Indicator (TGSI) is a device set into the surface of a public pathway that creates a tactile surface that can be felt underfoot or with a cane. It is designed to alert pedestrians, particularly the vision impaired to the presence of a hazard or a point of interest adjacent to a pathway such as a bus stop or a pedestrian crossing. Use of Tactile Ground Surface Indicators (TGSI) shall be in accordance with DDA requirements and any Council strategies for disabled access. The use of TGSI will be minimised by designing for a continuous path of travel in order to avoid their need at minor access street intersections. Changes of footpath direction at crossings are therefore discouraged. Footpath and Pram Crossings (kerb ramps) in new subdivisions shall be provided in accordance with DDA requirements. Location and alignment shall support the principle of “continuous path of travel” requirements. The top of the ramp is no more than 3000mm from the intersection of property lines. TGSI are required at all kerb ramps that do not comply with the above, at all mid block crossings, and at high usage vehicle crossovers, e.g. service stations and shopping centre car parks. Directional and warning TGSI will always be required at mid block pedestrian or school crossings, tram and bus stops. 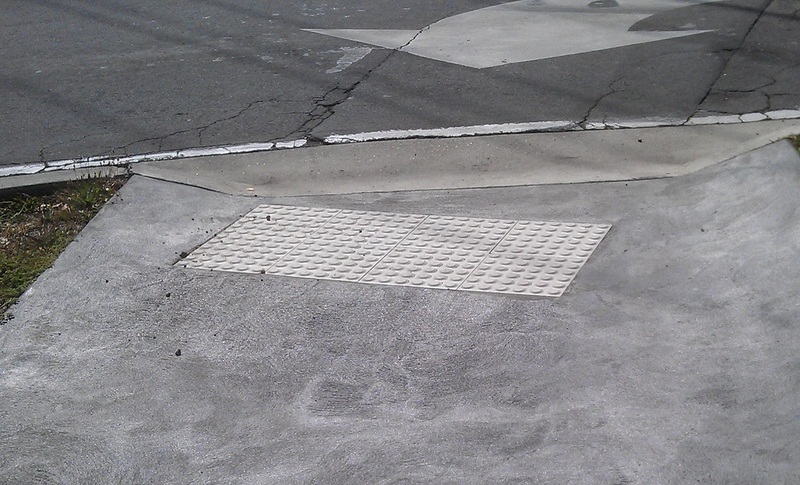 Section 8.3.27 of the Austroads Data Standard for Road Management and Investment in Australia and New Zealand V2 refers to TGSIs as 'tactile paving' which its defines as pavers used on approaches to pedestrian crossing point to aid visually impaired persons to a safe crossing point.